The B4000 roughly follows Ermin Street, to Baydon. Ermin Street was built by the Romans in the 1st century as the road between Silchester and Cirencester. Wickham was a day’s march from Silchester and thus, an important junction. Minor roads led to the Bath Road and Littlecote. The A4 London to Bath road - always known as the Bath Road - had an important stopping point at Halfway for coaches in the 17th and 18th centuries. The tollgate, just west of the Halfway Inn was sadly demolished in the 1960s. In 1971 the M4 cut its way through the widest part of the parish via Easton, Welford and Wickham, on its east/west route. ​Welford Parish has the two churches, or more correctly a Parish church and a Chapel of Ease. 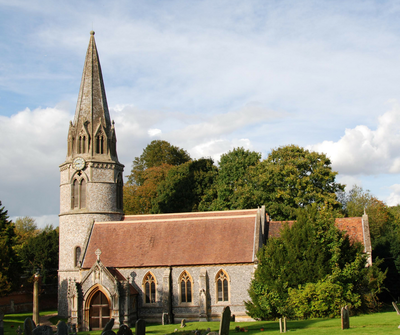 St Gregory's church at Welford (Norman) is believed to have been built on the foundations of an earlier Saxon church. It nestles in the valley close to Welford House. 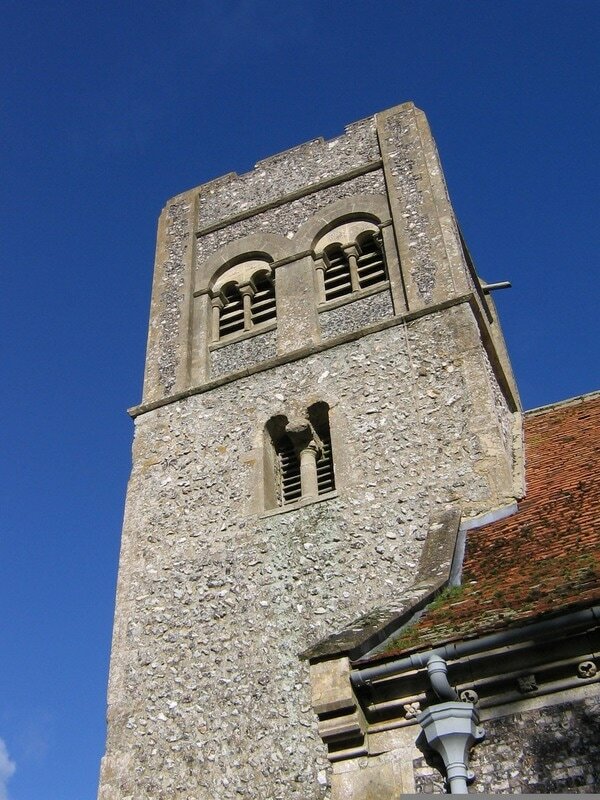 Its octagonal circular spire and tower is one of only two round towers in Berkshire. 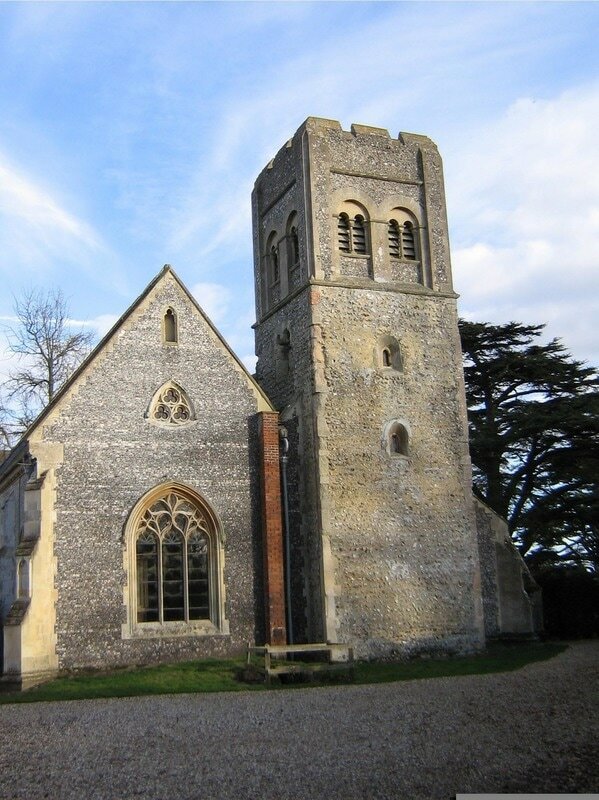 St Swithun's chapel at the top of Wickham hill is 12th century but built onto a much older Saxon watch tower. The tower is one of the best examples of Saxon workman ship in the country and is referred to in many reference books. An early example of recycling is evident by the use of Roman dressed stones and a column in the north side of the tower. Between 1845 and 1858 both churches were demolished and rebuilt by the rector, Rev. William Nicholson. The spire at Welford was carefully taken down, all the stones numbered and then rebuilt exactly as it was. In the rebuilding both churches were enlarged. The Saxon tower at Wickham escaped demolition but the Rev. Nicholson could not resist adding 30 feet of Victorian flint work to the top of it. Wickham chapel is most famous for its papier mâché elephants in the roof of the north aisle. These were purchased by the rector at the Paris exhibition in 1862. There were originally three, which he meant to display in the rectory (now Wickham House) but unable to find anywhere suitable to put them, he had more made and placed them in the church giving them names such as Fortitude, Docility and Strength - all good Victorian virtues! They were originally gilded and must have looked very impressive. Over time they have become somewhat tarnished - many people travel from afar to see these elephants. Until the end of the 2nd world war the majority of people were employed on the land. From the census they are described as 'agricultural labourers'. Also from the census it is obvious that each village was virtually self-sufficient. Almost all had many craftsmen such as bakers, tailors, leatherworkers, wheelwrights, bricklayers, blacksmiths and carpenters. Most of the farms within the Welford estate were tenanted. The glebe (church) land of over 270 acres in Wickham, south of the B4000, was incorporated in Rectory Farm and was farmed on behalf of the rector by an appointed agent. The Old Rectory was sold in the 1930s and the land in the 1950s. Only a small field remains behind the current rectory. In 1821 the population was 1,058. In 1911 it was 722. In 1931 it had gone down to 631 and in 2008 it was 450. With the changes in agricultural practice since the Second World War and their acceleration in the second half of the 20th century, the number of people working on the land has been drastically reduced. During this time a number of the farm workers' cottages became redundant. Some were demolished and some sold and modernised. Most were thatched and expensive to maintain. Welford House (now Welford Park) was built on the site of a minor monastery, one of the many that came under the control of the abbot and monks of Abingdon Abbey. It was a favourite place for the abbots to stay with a plentiful supply of fish, from the large hand-dug fishponds as well as game from the forests. On the dissolution of the monasteries in 1536 Henry VIII kept Welford as a personal hunting lodge and estate. In 1546 it was leased to Sir Thomas Parry. His son, another Sir Thomas sold the property to Sir Francis Jones, Lord Mayor of London. In 1680 Mary Jones, the great granddaughter of Sir Francis and sole heiress, married John Archer. The present house was built in 1702 and the estate of about 3000 acres has passed down through the family to the present owners, Mr and Mrs James Puxley, through male and female lines and with a few name changes. For 50 years the grounds have been opened for snowdrop days. Takings from the four Sundays in February are generously donated to local charities. ​During Second World War 600 acres was commandeered to form Welford airbase and occupied by the American 101st Airborne Division. The base was visited by Winston Churchill and General Eisenhower to witness a practice parachute drop prior to the Normandy invasion. On the night of 31 March 1944 the eight man crew of Lancaster Bomber DV290 were on their way back from a raid on the German town of Nuremberg. At some point, the crew saw the lights of Welford and, probably not having an operational radio, decided to land unannounced. As the aircraft lined up on the runway the lights were extinguished believing the un-announced aircraft to be German. The result was that the aircraft struck the runway and the fuel tanks exploded, destroying the aircraft and killing all the crew. In 2000 permission was given to raise a memorial in the station memorial garden to the crew. This was dedicated and many of the families of the crew were present. The base is now used jointly by British and US forces. Underground silos on the base have been used for the storage of conventional arms. Local Historian Enthusiast, Bob Chandler, used to regularly write for the Parish Magazine. He'll continue to share his articles on our News Blog. All will be available on the History Archive there. You can also take a look at Bob's own website. Have some past to share? Bob is always keen to hear from others, with photos and memories. If you have some stories to share with us then please email Bob. Thank you in advance.